The sub-specialty of Orthopaedic Trauma has developed to provide expert care for patients with severe fractures (broken bones). In the past, these injuries too often caused disability, or even death. In the past 50 years, great strides have been made in treating fractures. Injuries that were previously managed with prolonged bed rest, traction, and casts are now often treated with operations that fix the broken bones, holding them together with special hardware while they heal. This usually allows a patient to be up and about, exercising and using injured legs and arms, helping to avoid prolonged stiffness and weakness. Most Rhode Islanders with severe fractures have been injured in motor vehicle crashes, particularly motorcycle crashes, or as pedestrians struck by motor vehicles. Other causes of serious fractures are falls from high places and severe workplace injuries. With a severe fracture may come other injuries—perhaps more broken bones, or damage to other parts of the body. Expert evaluation and rapid treatment may be necessary to save life and limb. Patients with complex fractures, or with multiple injuries, need the care provided by a Trauma Center, like Rhode Island Hospital, our region’s only such institution. In a Trauma Center, teams of surgeons, other physicians, nurses, and supporting staff, all focused on treating the patient and his or her injuries are immediately ready to care for seriously injured patients. The hospital must ensure that all resources are immediately available, 24/7. Trauma Centers develop and practice routines for treating severe injuries and their complications. 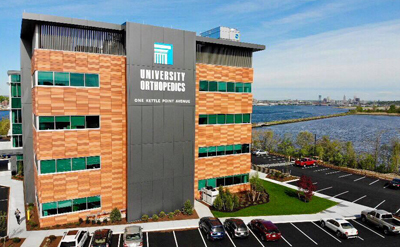 The University Orthopedics Trauma Center in Rhode Island is also ready to help patients who develop complications after injury such as bones that don’t heal correctly, or bone infections.